It’s been quite the pleasure organizing this 100 Best Canadian Films series. For those who are passionate about Canadian cinema these lists, I hope, should spark a completest curiosity towards discovery. The lists in the series are meant to be personal and subjective histories of Canadian cinema which should showcase its fluidity, richness and diversity. We’re nearing the end of the series, though I’ll wait for a few more others before concluding it, but once it’s over I plan to put them all together into one mast list. I think it’ll be quite special. But for now, I need to thank Stacey Donen for this new contribution, as he’s always been someone that I looked up to in terms of seriously engaging and promoting Canadian cinema. Some of these accomplishments include programming one of the all-time great films Jean-Marc Vallée’s C.R.A.Z.Y. at TIFF when he was there as a Canadian film programmer from 1999 to 2006. This programming of Canadian films was also the impetus behind his distribution company College Street Pictures, which released two of the important early Toronto DIY films, Kazik Radwanski’s Tower and Igor Drljaca’s Krivina. This active engagement to increase an awareness of the best of Canadian cinema is such a great quality. More folks could definitively benefit from this approach. Other 100 Best Canadian Films lists includes those by Michael Marlatt, Jim Sheddan, Philippe Gajan, Kevin Laforest, Steve Gravestock, Olena Decock, Dan Browne, Réalisatrices Équitables and Films Fatales Montréal, Helen Faradji, Fabrice Montal, Stephen Broomer, Paul Corupe, David L. Pike, Jerry White, André Loiselle, Paul Williams, Greg Klymkiw, Pat Mullen, Jason Anderson, Daniel Kremer, Yves Lever, Piers Handling, Marcel Jean, Mike Hoolboom and myself. – D.D. And make sure to read the shy kids interviews on the Toronto Arts Report with Matthew Hornick, Greg Francis, Patrick Cederberg, and Walter Woodman. 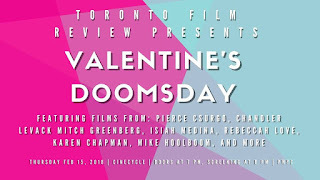 The inaugural screening in a new program Toronto Film Review Presents (please like us on Facebook!) 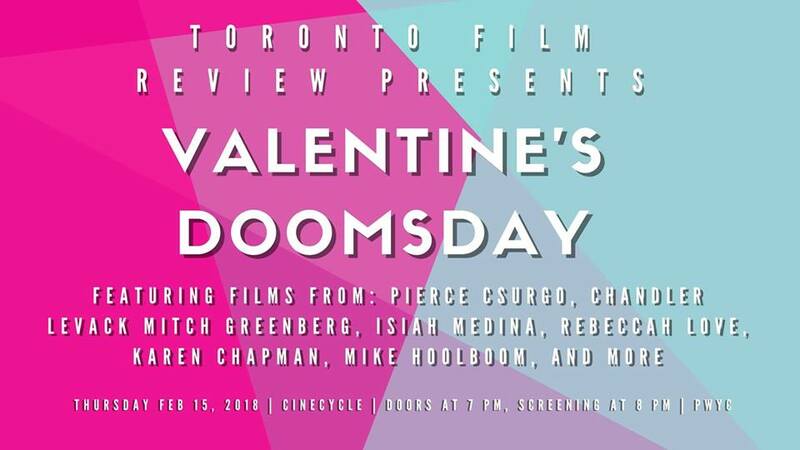 Valentine's Doomsday will be a night of short films, mostly by emerging Canadian directors, on the evening of Thursday, February 15th at the CineCycle. There will be a pre-show, romantic comedy trivia for some prizes, a full program of nine shorts (including a fun trailer, so that it feels like you're at the movies), a brief question period and afterwards we'll be launching Mitch Greenberg and Pierce Csurgo's new web-series La chasse with a dj set, drinks and snacks. This will coincide with the online launch of the webseries, which has already started to go up. The full program includes: Rebeccah Love’s Garden, Connor Jessup's Lira's Forest, Mitch Greenberg’s Ghosted, Chandler Levack’s We Forgot to Break Up, Pierce Csurgo’s As Above, So Below, Kathleen Hepburn's Never Steady, Never Still, Karen Chapman’s Lessons Injustice, Mike Hoolboom’s 3 Dreams of Horses and Tono Mejuto's Quiasma. It should be a lively, diverse and impressive screening, which we're happy to have put together. The event is pay what you can (with a five dollar suggestion) and there will be cheap drinks available. Doors are at 7:30 pm, the pre-show begins at 8:00 pm and the screening start at 8:30. We hope to see some of you there!